I hope everyone is well, I’ve been sick again since Sunday and am having a few days off work to hopefully recuperate. I saw the doctor today and he is arranging for me to have physiotherapy on my neck. The neck seems to be a problem area for me, causing severe headaches and nausea. The doctor also gave me some medicine to take to stop the sickness so that I should at least be able to take and, more importantly, keep down pain-killers when necessary. Anyway I still managed to get my January calander completed and the new page for February is ready for tomorrow. I will try and use more images for February. January seems to have zipped by in a flash! T and I are making plans for a short holiday in July to celebrate his 60th birthday we are going up north to Yorkshire, where he was born, for a week. At first he was very reluctant to go away because since our last holiday together we have adopted two beautiful cats. T didn’t like the idea of putting them into a cattery for the week, so he is paying someone to come and house/cat sit for us. I’m sure ‘the boys’ will still be freaked out at having a stranger in the house, but it should be OK as soon as they realise he is going to pet and feed them and let them out every morning. We live in a cemetery and the cats are allowed out in the morning and can play in the cemetery all day, but we like to have them inside at night. There are foxes in the cemetery and although everyone says that in general cats and foxes tolerate eachother and in a fight the fox is likely to come off worse we don’t want to risk it. As far as we can tell ‘the boys’ don’t venture outside of the cemetery, it covers 12 acres of land so they don’t really need to go out on the roads. But then who really knows what they get up to when they are out of sight? That’s all for now, I hope to get back to normal soon. This entry was posted in 366 Challenge and tagged 366 challenge, Kate Crane, layers, mixed media, paper, The Kathryn Wheel by ajsartjournal. Bookmark the permalink. Nice calendar! Love the colors! Hope you are recovering well. Do take care! Thank you Betzzz, feeling better now so back to work tomorrow. I appreciate your kind words. love the writing on each day, it looks so different with the writing on. love it. I really like the colours on your page and the sentiment is lovely. Dianne. awesome pages! I love how you have them laid out and also the saying on each one. Very nice! Hope you get to feeling better soon…that is absolutely no fun. 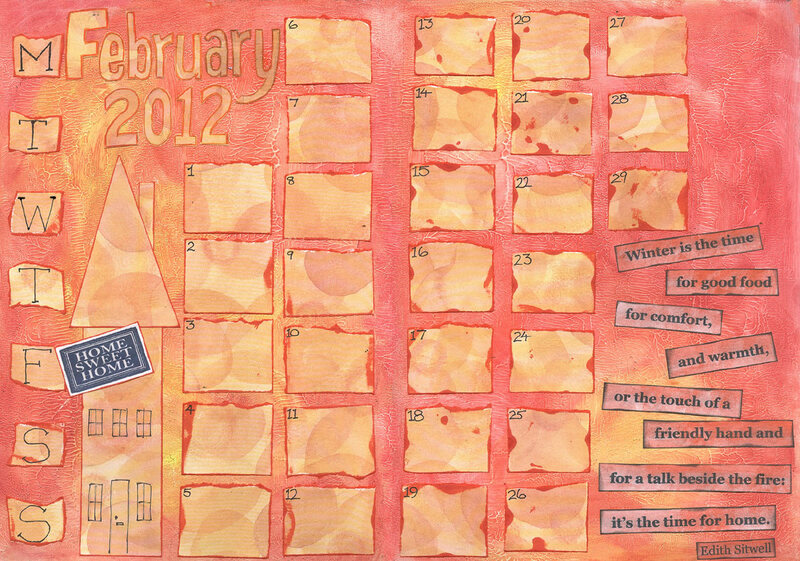 Your months are inspiring; love the journalling in January and the colors and vibrancy in February. Looking forward to March. I have been missing visiting your site on a regular basis. It takes forever to download even the simplest webpage using my dial-up, so I stick to the basics of news and weather and posting to my own blog. When I am here at the library, I have been concentrating on catching up on classes I missed before I got the laptop. But I am finally caught up on all the old lessons, so I should have time to visit other blogs more regularly. I enjoyed looking through your pages you have put up since I last visited. You have been doing some nice work. 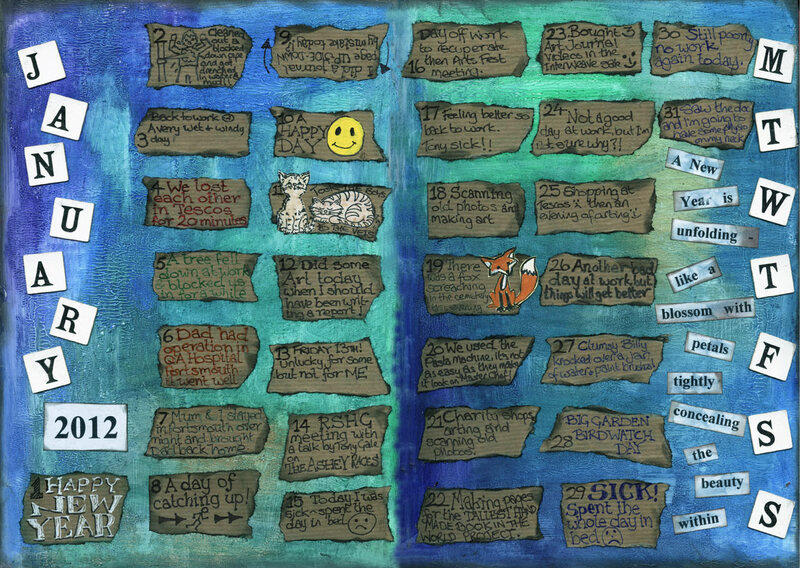 I liked the way your calendar turned out. The months seem to zip by faster and faster. I hope the medication and therapy solves your problem and that you are feeling better soon. Give your cats a good scratch behind the ears from me. pages look fantastic, I hope you enjoy your week away and to getting better. Congratulations on your new cats. Hope you feel better soon. I’m glad that you managed to keep up with your pages despite being unwell. Love your colour choices and the shape of your daily journaling blocks. Hey, I live in north Yorkshire – where will you be going?